CD review: "The Orphan's Lament"
Like the Bulgarian Women's Choir and the singing monks from Spain, Huun-Huur-Tu has brought a once-obscure musical tradition to the mainstream American public's attention. A few years ago, the quartet from Outer Mongolia had a U.S. release ("Sixty Horses in My Herd") and tour that made Tuvan throat music somewhat popular, if only briefly. 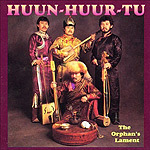 The lilting lyrical lines, the call and response that obviously tells a story (even if it is unintelligible to most American listeners) and the haunting throat singing (in which a single singer can create several distinct tones at the same time, providing a sort of self-harmonizing) make Tuvan singing instantly recognizable to anyone who's ever heard it before. "The Orphan's Lament" illustrates the universal nature of even the most exotic music. The Tuvan stringed instruments may look strange, but they sound close enough to our guitars and mandolins to seem familiar. Even the dazhaanning khavy, a rattle made out of a bull scrotum and sheep knee bones, isn't too far removed from a simple Mexican maraca. Frankly, it's not the strange instrumentation or the novelty of the singing technique that keep this CD in the stereo  it's the beauty of the traditional songs from Tuva and the passion with which the men of Huun-Huur-Tu perform them.